NOTE: For current Wetpixel expeditions, please visit our expeditions page. 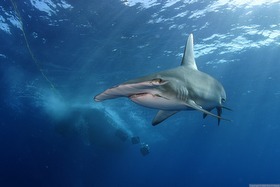 Come photograph sharks and dolphins in the Bahamas with Wetpixel aboard the M/V Shearwater! 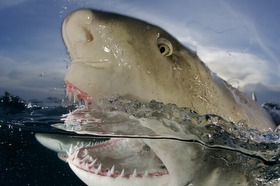 We have 3 Bahamas expeditions in 2009, including a winter shark expedition and a summer sharks & dolphins expedition. See below for trip dates and booking details. February is a fantastic time for shark encounters in the Bahamas because the water temperature is a little colder than it is in the summer months. 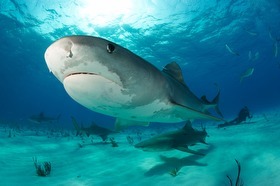 We'll definitely see tiger sharks, lemon sharks, reef sharks, and will have a good chance of encounters with great hammerheads and bull sharks. 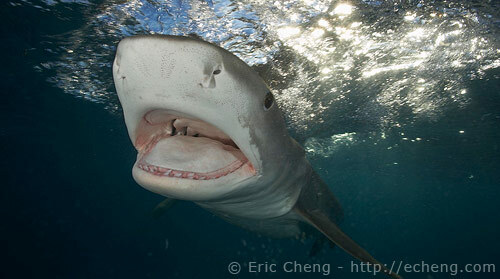 Led by Alex Mustard Photograph oceanic white-tip sharks and domestic pigs (yes, you read that right) with Wetpixel. See our trip report from 2008 for what to expect! To see a trip report from an expedition led by Alex Mustard, check out this thread in the forum. I love going to the Bahamas in the summer. You can expect warm, flat water, tiger sharks, reef sharks, lemon sharks, Atlantic spotted dolphins, and bottlenose dolphins. 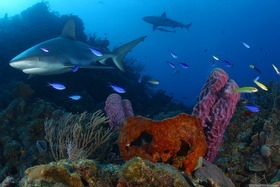 Check out the Wetpixel Sharks & Dolphins trip report from 2007 to see what to expect. NOTE: We screen our passengers, and accept advanced divers with shark-diving experience ONLY. I hate to have to say this, but please do not book if you are squeamish about using bait to attract sharks. We will absolutely be baiting sharks in, and do not want to fight with you about the issue.